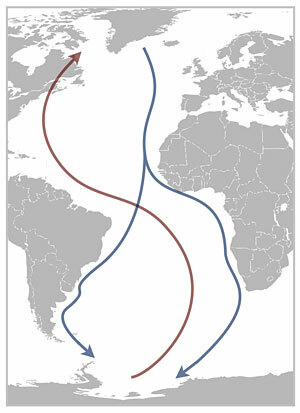 Arctic Terns make the world’s longest migration as they fly an average of 40,000 miles annually between the northern and southern polar regions. I became interested in long-distance migratory birds after observing Arcitc Terns during my travels in both the Arctic and Antarctica, and learning that they complete an annual migration of 45,000 miles. Recently, ornithologist Nate Senner introduced me to Hudsonian Godwits, shorebirds that make an incredible 6,000+ mile non-stop journey during their migration between the sub-Arctic and South America. Traversing countries and continents, these birds are true global citizens and emblems for climate change awareness and global protection. With a lifespan of 30 years, they may fly more than a million miles! 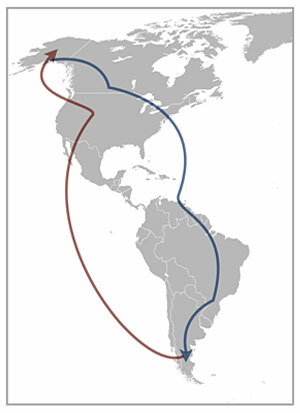 Details of their route and migration were recently discovered by a team led by Danish scientist Carsten Egevang who equipped birds with lightweight geo-locator loggers. The nesting ground of Sand Island in NE Greenland was one site where scientists outfitted fifty birds in 2007. I visited a research camp on Sand Island in 2010 as part of my High Latitudes expedition, where I camped adjacent to the Tern colony. There I observed (although could not re-capture) one bird still wearing a data logger. The Tern’s graceful form, acrobatic flight, and bi-polar migration inspired a series of paintings. In May of 2012, I joined ornithologist Nate Senner in Beluga, Alaska. The region is a hotspot for nesting birds with the vast tidal mudflats of Cook Inlet as well as rich wetland habitats. Nate studies Godwits, a shorebird family that has the longest non-stop flight of any bird. In Alaska his research focuses on Hudsonian Godwits (HUGOs), and he’s discovered they can fly over 6,000 miles non-stop as they travel from the North American sub-Arctic to the tip of South America. Senner tags HUGOS with data loggers to track their migration and also studies additional environmental data to learn how they are coping with pressures from climate change and environmental degradation. I worked with Nate and his team in Alaska to document their work. Special thanks to Dr. Erik Born and Nathan Senner for their field support and collaboration. I also thank Carsten Egevang for his research support. I am tramping around in sub-arctic peat bogs and tidal flats with scientist Nathan Senner. Getting to know Beluga, Alaska, where I’m learning about migratory birds. I made it safely to Beluga, Alaska! It was a grey, rainy trip.